Ok, I’ve neglected this space for just about a month. I didn’t intend to. It’s just that I always think I need to wait until I have something significant to write before I use the prescious time and blogspace. That’s sort of dumb since the purpose, in my mind is just to get the thoughts out there. Anyway, I’ve recently stumbled across an old grade school aquaintence from St Rose of Lima Catholic School in Paso Robles Ca. I knew who he was, but he most likely wasn’t aware of me. He was three years older, and us younger kids were generally prety insignificant to the older ones in grade school. Actually, when I contacted him through Facebook, I’d gotten him confused with another guy with the same first name. Give me some grace here, that was a looong time ago. So he told me about a song that he recorded called, “Sister Charles Ann” Now that was a mind blower for me! Not just that a nun would name herself that, but that I knew her. She was my teacher in 2nd grade, my first year in Catholic school. She was also the deliverer of my only two school spankings. Big time trauma. She obviously had quite an impact on lives. I mean a grown man wrote a catchy bluesy rock song about her. It’s not a particularly flattering song, to understate matters, but all these years later (I won’t say how many) he had to purge himself with a song. In his dedication of the song he listed her as the woman who gave him more beatings than both his parents combined. Now that’s a tribute to school discipline. Sister Charles Ann. That’s a rather odd name for the collective psyche of a bunch of 1st and 2nd graders. I mean did her parents want a boy? 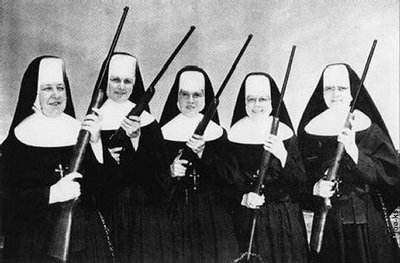 The other nuns in the school had names like Sister Theresa Frances, Sister Lorraine, Sister Bernadette. How in the world did my Catholic school career start off with Charles Ann? I recently heard that she has since passed on. My intention is not to speak ill of the departed. We might have been able to relate, in a civil, cordial manner once I was an adult. Perhaps that would have removed the intimidating monster-like image of her that I’ve harbored all these years. If I ever got to talk to her grownup to grownup, I may have worked up the nerve to ask her where on earth the name came from. This page took 1.143 seconds of computer labor to produce.